The first time I read Marie Kondo’s book, The Life-Changing Magic of Tidying Up: The Japanese Art of Decluttering and Organizing, I was bopping around Asia with my dad between graduating college and starting my first job. It was perfect timing; about to begin a new chapter in my life, I was immediately drawn to the idea of purging anything and everything that didn’t, as Kondo says, “spark joy,” in the hopes of jumping into my career (and adult life) with a fresh start and a fresh head. I’m certainly not the only person who, after learning the KonMari method, went home, dumped the entire contents of their closet onto their bed, and began the process of “tidying up.” Kondo’s book, first published in the U.S. in 2014, has spent years on The New York Times bestseller list. And after the launch of her Netflix special, Tidying Up With Marie Kondo, at the beginning of 2019, Marie Kondo is hotter than ever. Thrift store donations are reportedly at an all-time high. Her method has become the new thing of the new year, helping people of all organizational abilities declutter their lives so they can better focus their energies. Believe it or not, you can KonMari your work life, too (although no, you can’t just get rid of that co-worker who isn’t bringing you joy). I reached out to Tricia Fidler—a gold-level certified KonMari Consultant and the founder of Heywood Park Collective, a KonMari Method consulting practice based in California—for tips on how to apply the method to your desk, inbox, and ultimately your career. There’s no doubt that a lot of people have benefitted one way or another from the KonMari process, from the families featured in “Tidying Up” who feel more connected to one another and less stressed about their homes to viewers who’re proudly showcasing their newly spruced-up closets. Applying this strategy to work, says Fidler, can reap the same rewards. “Just like when you go into your closet and ask yourself, ‘Does this blazer still represent me? Do I want to carry it forward in my life?’” she says, when you go through your desk drawers, office bookshelf, or even your inbox, you don’t just clean up, you start to ask yourself the tougher questions about yourself and your career. “It’s a values-driven process… When I ask what sparks joy for me, I’m really asking what are my values?” she says. And as you think about your work life in this way, “you get in the learner mindset of what is this job bringing to me and what do I bring to it. And by that process you fine-tune your decision-making skills, which makes you a better employee,” she adds. For those who don’t know anything about Marie Kondo, here’s how her process goes. She divides all possessions into five categories: clothes, books, papers, komono (miscellaneous items), and sentimental items. Then, she suggests putting everything from that category (yes, every single item, no matter where it’s stored) into one giant pile and going through each thing one by one to see if it “sparks joy.” Among several rules Kondo has, you can’t put it away until you’ve decided exactly what you’re going to keep. The idea of doing this can be daunting (and maybe ridiculous to some), sure, but at the base level it’s about deciding what’s worth your time, space, and energy—a concept that transcends physical things and applies to any aspect of your life and career (more on that later). One of Kondo’s signature moves is greeting a house and thanking it for its service before leaping into cleaning. Before you roll your eyes and tell me this has nothing to do with your workspace, hear me out. Your desk has done a lot for you. It’s been a place where you’ve accomplished so much—it’s where you nailed down that pitch, wrote that perfect copy, upsold that big client, earned a promotion, or launched your business. And being grateful for all it’s provided you—and thanking those items you have to let go for contributing to your success and happiness—forces you to reflect on everything you’ve done up until this point in this one small spot. At home, this may mean clearing out a room so you don’t have to worry about it getting dirty as often. At work, it may mean creating a cleaner space for you to focus on the projects that matter to you. If that’s the case, your intention should be to keep only the items you believe will help you achieve this goal (or at least move them to your home). For example, you may decide to keep a figurine your team bought you for your birthday or a photo from your latest retreat because they make your desk feel more like home. But those 42 leftover soy sauce packets from the time (let’s be real, times) you ordered takeout? That book someone sent you that you’re never going to read? Those notes you took at that training and development meeting that you never refer to? Those can go. Sparking joy is a piece of cake when you’re holding your favorite sweater or a picture of your family. It’s not as easy when you’re looking down at a stapler or expense report—so how do you reconcile this? Fidler compares this situation to evaluating a hammer or other hardware in your house that’s maybe a necessity but not something that’ll stir up emotion. She suggests “that we take a step back” and think about how we feel when we’re using that particular item and “how it helps us get the job done better.” In this case, you might think twice before tossing away a pen you like using or a pair of scissors you always seem to need. But, Fidler explains, there may be items in our desk that spark negative feelings. She suggests “exploring what the discomfort is about” to put yourself in a better position going forward, whether it’s talking to your boss about a discouraging email or a team member about a project you’re stumped on. Everything that doesn’t fall into those three “to keep” categories, it’s up to you as to how you toss them. You can delete or trash them, or if they’re digital, archive them so they’re out of the way. I noted to Fidler that our space online—unlike our physical space—is basically infinite, and wondered whether it’s considered “cheating” to keep so many of our digital items because, well, we can. But to her, it’s less about getting rid of emails (or any documents) forever and more about deciding how many you keep in front of you at one time. “No one’s going to go in and say, ‘Gosh is your email cleaned out!’” she says. “But [having a lot of unread email] does have residual stress on us,” she states. Whether it’s a drawing one of your kids gave you, a nice card you got from a client, or a toy you won at your company’s latest outing, display those items that bring you the most happiness front and center. They’re the things that’ll keep you going on those (hopefully rare) bad days. Like we said earlier, you might not be able to get rid of things that don’t spark joy but are necessary to do your job. But what you can do, Fidler says, is store them in a pleasing way—whether that’s using fun file folders, cute boxes, or funky containers. This applies to anything you decide to keep. More importantly, she emphasizes, “choose storage areas that are easy to put things back in.” Part of what makes us so disorganized is the fact that it’s difficult for us to put things back where they belong. So, make it super easy for future you to stay neat by using storage that’s seamless to put items into and take items out of. (If you’re feeling really KonMari, store them vertically.) And avoid having filing systems that are too complicated if it means you’ll let things pile up rather than deal with the hassle of figuring out which folder they go in. Finally, follow the Marie Kondo rule of pairing like with like. Pens should go with pencils and other writing utensils, cough drops and tissues should go with other first-aid items, books should go with other books. This makes it super easy to find what you need, when you need it. With whatever you choose to keep, Fidler says, you should have some kind of intention behind it. Maybe that’s an action, like finishing a report or shooting off an email reply. Or maybe it’s more sentimental and about sparking joy, in the case of a framed picture or motivational Post-it. 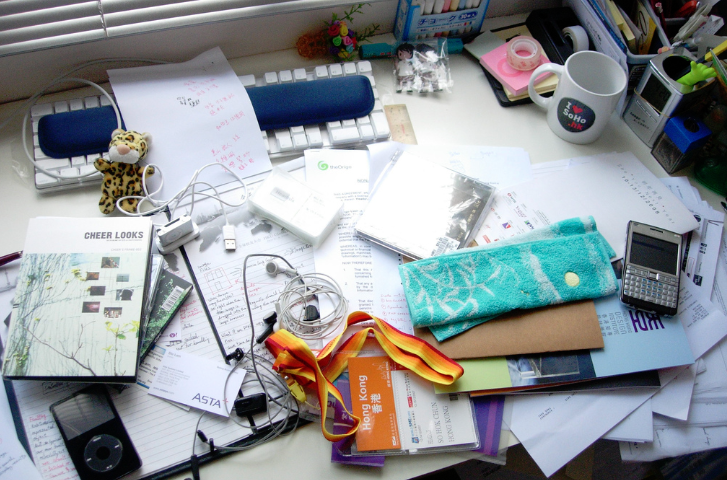 But this forces you to really consider what you need and don’t need in your workspace. And, it holds you accountable to follow through on the items that are lingering around. Once you get into this mindset of considering how something can “spark joy,” you might find that it can apply to more than just your stuff. You may tidy up your calendar, for example, and decide to cut down on certain meetings because they’re not actually contributing to your success. Or you may narrow down your network, choosing only to keep in close contact with those people who make you feel good about the work you’re doing. Or you may say no to certain obligations to focus your energies on those you’re most passionate about. You can also argue that the simple act of cleaning does more than just physically clear up space—it clears up mental and emotional space, too. We’ve experienced this a thousand times over every time we try (and fail) to be productive at a messy desk or in a crowded office. One person Fidler worked with was a psychologist and healer, who believed a lot of the stuff in her office was distracting and overwhelming for her clients. By clearing out a lot of the clutter, she was satisfied to find that the room offered more clarity for herself and her patients. But it goes even further than that. When we begin clearing out our possessions, we start to make little decisions that build to us reevaluating how we work. We start by asking, Do I really need this? Is this tool getting in the way or taking up space? Do these books represent the job I’m doing now? Will they serve me going forward? Then, your mind expands into the deeper questions: How about this item related to that task—is it something I still enjoy doing? Does this letter of recommendationreflect who I am today? This feedback reminds me of that project I loved working on, how can I reincorporate this into my role again?